Yummy seafood chowder is perfect for a miserable wet cold Tuesday. The seafood chowder from the Something for Everyone cookbook is great but wanted to try a Chelsea Winter recipe for seafood chowder today because it makes a larger quantity suitable for afternoon tea and dinner. Chelsea’s recipe has some extra ingredients compared with the Something for Everyone chowder; 1 1/2 cups of wine, 1 1/2 cups of cream and zest of a lemon and the juice of a lemon. It was easy to convert. Can’t share recipe on this blog but it’s from her Everyday delicious cookbook. You could replace the cream with evaporated milk or milk for a lighter chowder but it’s so tasty I’m glad I didn’t go “light” today. Blitz garlic, onions, celery on speed 7 for a second, then sautéed in butter for 6 minutes at 100 c.
Add wine, cooked off for 5 minutes at 100 c with MC off. 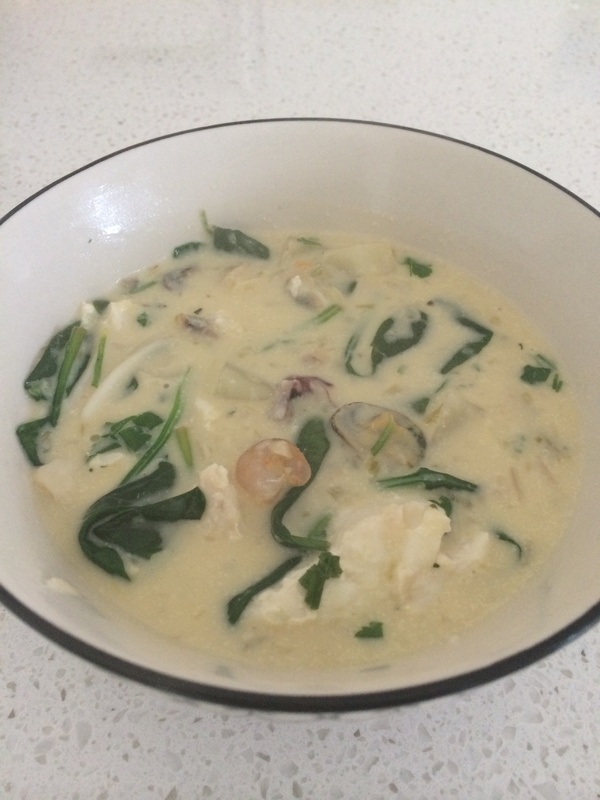 Add milk and cream to soup in TM bowl, cook 6 mins 90 c.
Transfer to a large pot ( with the addition of seafood this chowder goes over 2.2 ltr bowl ) add fresh spinach ( wilts in the hot soup) cooked seafood and potato, zest and juice of a lemon, fresh / dried parsley and dill. Season with salt and pepper Reheat to serve. So yum.